The Outer Banks of North Carolina are a popular summer beach vacation destination, and many families return year after year. When we go, we love to spend as much time as possible in the ocean swimming, body boarding, and surfing. However, on a week-long vacation, there are times when even the most avid beach lovers need a break from the sun and the sand. Here are ten fun things to do in the Outer Banks with kids – after you’ve spent plenty of time playing in the Atlantic Ocean. The Outer Banks is a two-hundred mile pennisula between the Atlantic Ocean and the Currituck Sound. Our favorite actvity to enjoy on the sound is crabbing. To catch crabs you need a bucket, a net, some raw chicken and kite string. We buy the cheapest chicken we can find (usually chicken backs or thighs), cut it into large chunks and tie it to a long piece of kite string. Drop your chicken in the sound and wait a few minutes and inevitably a blue crab will grab onto the chicken. Before lifting the crab out of the water, scoop it up in the net and drop it in a bucket filled with a little water. We have always enjoyed catch and release, but you are allowed to keep the crabs to eat if they are over 5 inches in diameter. There are several areas of the sound with public access where you could go to enjoy crabbing. Many rental communities also have sound access as one of their listed amenities. The Currituck Sound is a great place to take a break from the beach. You can kayak, jet ski, or swim in the sound, and it is a great place to catch beautiful sunsets as well. Visitors to the Outer Banks should not miss the Wright Brothers Memorial in Kitty Hawk. Walk along the field where they first flew their historic flights, and let the kids do the junior ranger program and play on the airplane replica. Hungry afterward? Stop by Kitty Hawk’s Frozen Custard and Beach Fries from some family-friendly food your kids will love. An Outer Banks tradition for many years, Duck Donuts is a family favorite donut shop. They make cake donuts fresh in the store while you watch, and top them with any variety of made-to-order icing flavors and toppings. Maple-bacon? Strawberry coconut? Chocolate with sprinkles? They’ve got it all. The line will be out the door every morning of the summer but they are used to crowds and can fill orders fairly quickly. Pair a donut with hot coffee or chocolate milk and make Duck Donuts part of your Outer Banks tradition. Bring your bikes or rent a beach cruiser from one of the many beach rental shops in the Outer Banks. There are miles of family-friendly bike trails. I’ve spent the most time biking in Corolla, and I love biking around Corolla and stopping for a frozen yogurt or biking to the Currituck Lighthouse. If you’ve never ridden a beach cruiser, their comfortable seat and fun handlebars are a unique experience that even the most nervous of bike riders can enjoy. Anyone who loves fish will want to make a stop at Jennette’s Pier. This tourist attraction offers fishing classes, shopping, and great views of surfers in the waves near the pier. You can also watch fishermen bring in their catches from the ocean. There is a small fee to walk on the pier, but plenty to enjoy once you get there. You can also visit a museum and aquarium at Jennette’s Pier. There are five lighthouses to explore in the Outer Banks: Currituck Beach Lighthouse, Roanoake Marshes Lighthouse, Bodie Island Lighthouse, Cape Hatteras Lighthouse, and Ocracoke Island Lighthouse. Some are open to public to climb for great views and others offer visitors centers. Check out details about what to do at each one here. In Corolla, I love taking a bike ride to the lighthouse. It costs $7 to go up the Currituck Beach Lighthouse, and on busy days there is sometimes a wait, but the picturesque views are worth it. The highlight of our beach week is catching ghost crabs on the beach at night. It’s a scream, quite literally. 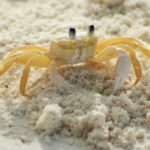 I’ve given lots of details about catching ghost crabs in this post, but if you go to the beach after dark with a flashlight and a bucket, you will find plenty of white ghost crabs scuttling along the beach. Brave kids (and parents) love to catch them, and the rest love to scream about the fun event. Our favorite tradition is catching a bucket full of crabs and making everyone stand in a tight circle when we release them. The bravest are those who can stay put while the crabs run away. Jockey’s Ridge State Park in Nags Head boasts the tallest natural sand dune system in the Eastern United States. Plan to play on the dunes when you visit this state park. This is one of the best places to fly kites in the Outer Banks, and you will often see hang gliders there as well. You can bring a picnic, remember plenty of water, and plan to wear your shoes since the sand can be extremely hot in the summer. There are plenty of good eats in the Outer Banks, but one of our favorites is a little shack called Corolla Village BBQ. This walk-up window service BBQ joint specializes in chopped pork BBQ with a delicious North Carolina vinegar sauce, hickory smoked chicken and ribs. Many people pick up take-out here, but we like to enjoy it on the picnic tables just outside. There is a small park just across the parking lot where kids love to play after lunch or dinner. My recommendation is to arrive early. They are open until 8:00 p.m. in the summer, or until they run out of food, which has happened to me more than once. Wild horses roam the beach just north of Corolla, and there are several outfitters who will take you out in 4×4 wheel drive vehicles to see these wild mustangs. For the more adventurous, the beach north of Corolla is open to anyone with a 4×4 vehicle and you can go looking for the horses yourselves. Just remember not to feed, pet or attempt to ride these horses. They really are wild horses and they may kick or bite you. You can find the traditional mini golf courses, ice cream shops, and tourist attractions that seem to popular in beach towns, but this list of 10 things to do in the Outer Banks with kids will help you enjoy activities unique to the Outer Banks as you vacation in North Carolina. Ready to visit the Outer Banks? The Outer Banks can be enjoyed all year long, but this is not a tropical beach. Peak season is June-August, and many restaurants and shops shut down between early October and Easter weekend. Check out my tips for planning a trip to the Outer Banks or 10 things to consider when you rent a vacation home.